One year ago today, two amazing moms saved a life of another mother, and delivered her pups two days later. This pregnant puppy was in a high kill shelter when Kirsten from a pet rescue made a call out to her friend, Christina, asking if there was any way she can take her in and save her. "Operation Save Penny" went into full effect. Christina, a mother with three young beautiful children already, didn't hesitate, and took the drive to rescue and save this sick, pregnant puppy, Penny. 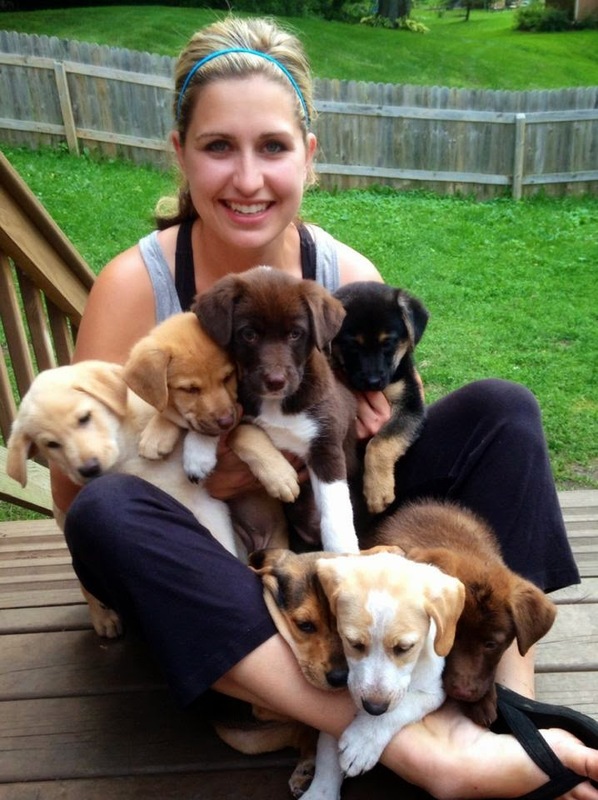 Two days later, Christina and her family delivered 7 adorable puppies at their home, yes, at their home. 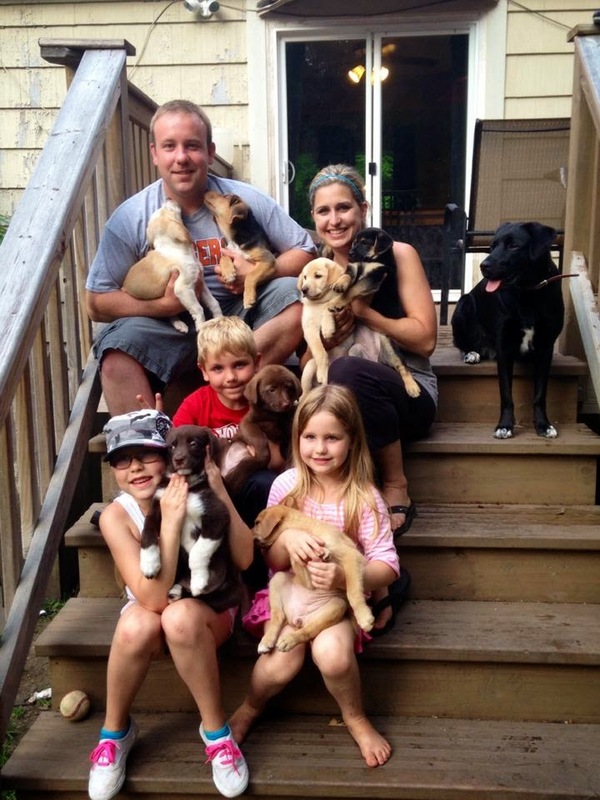 They not only saved Penny, they saved her 7 pups; seven lives that almost never were. Christina bottle fed these babies because Penny, was not in good enough health for her babies to feed from her. With the help of Christina's friends and family; donating cleaning supplies, food, time and more, these puppies, were loved, fed, cared for, and even potty & crate trained! At the same time Kirsten was working on the phone finding families that were willing to adopt. Working together, these moms were on the clock doing everything they can for these new little lives and their mother Penny. Families were found for everyone, The adoption took place with all the families together saying goodbyes & hello's at a public pet location. Penny went to a loving family as well! Eight families changed because two moms, went out of their way to make a difference. Our family welcomed one new addition, Logan, to our home at 3 months old. We nick-named him Orso, meaning the bear in Italian. Logan looked like an adorable little teddy bear to us, Orso seemed perfect and the meaning behind Logan could not be changed, who says puppies can't have a first, middle & last name?!! Three puppies were named after Christinas children and Logan, was one of them. As soon as we walked in we knew Logan and our puppy had a strong connection that broke my heart to separate. I knew both Logans took care of one another and that little man helped his mom take such good care of all the puppies. It was hard for them to say good bye to one another. It was an emotional adoption for all the families involved that day. We are very grateful to Logan, Kirsten from the Pet Rescue and all Christina's family and friends that came together to "Operation Penny" a huge success. We told our own kids the day of adoption that we were going to the pet store to visit some puppies so when we held Orso and the girls asked if we could keep him... the moment was absolutely priceless. "Yes" was something they never heard to that question. It was the day of Julia's 5 yr. old birthday, she was always the one pushing the hardest to leave with a puppy when we went to adoption shelters "just to visit". Yes, only two weeks after our puppy blog on June 15th, (Click here for that story!) Julia didn't have to ask anymore. So while others said to us, "Don't do it, don't give in!" We took the leap of faith, and here we are proud dog owners one year later!!! What a year it has been, I've never owned a dog in my life and always felt that most others that had a dog, just seemed to yell at them all the time. Give or take a few that loved them like their own child. Which brings me to exactly that, I don't know how Christina did it! A mom of 3 already and dedicating 3 months to 7 little pups AND their mother, AND potty training AND bottle feeding them! WOW! A true saint that made it happen. We were spoiled, a new puppy, potty and crate trained before even coming home with us! The kids couldn't get enough of him!!! Orso was growing fast, and learning how to raise him taught me even more. This family has more love for our sweet Orso than ever, and here I share with you, what every family should know when adopting. 1. They grow up fast... super fast. For every month he grew, my 7 yr. old Mia grew in a year! (This is how Cameron explained dog years to Mia, Julia & Maximus) It was true too! She grew up fast in 7 years and Orso grew up even faster in ONE! 3. You won't be perfect after the classes, but you'll understand more of how to work with your puppy. 4. BE PATIENT!!! Don't yell at them all the time, they don't understand your language, all they know is that you are angry and it scares them & they know when you are happy, and that makes them happy. 6. Be consistent! They are puppies, they will jump up, get into things, explore, get excited, you need to watch them and keep danger out of their reach! Be consistent with the schedule you keep them on and the disciplining when in training. Don't leave all the training up to someone who is not living with you and your new family member. 8. Don't make it a party when you get up or walk in your home. Anxiety and anxiousness from your dog is created from YOU! We keep Orso in the crate for 15 minutes when waking up, then let him out and 15 minutes after walking in the door from being gone. This keeps him calm and stopped him from jumping on others when we let him out of the crate. 10. Enjoy your puppy! Don't be screaming and yelling because YOU don't understand why or what he's doing, learn about your puppy and remember, they don't outlive you for the most part, enjoy them while you have them in your life and learn everything you can from them. What I've learned, is patience. I now have 5 children, yes 5! We include Orso in that count. I've learned that my kids will walk and feed Orso before the fix their own bed or do their own chores. They will sit and love him, they have fun doing different tricks with him. Things are put away quicker now so Orso doesn't get into things. The kids love introducing him to other dogs as his play buddy. Am I exhausted? YES! But do I regret it? NO. (He keeps me at a fast paced walk that I appreciate with him too, no slacking for me!) This is a puppy's life that almost never was and its our job to embrace everything about his beautiful life. We. Choose. Him. He is our family to take care of and love. If you are wanting a puppy or looking into it, learn about the responsibilities of what to expect with their first year of puppy love! Orso has already calmed down alot since his first year of puppy hood. We may call him Jaws because he still circles around the dinner table and nabs at the first chance of food he gets but we are working on it! We may not have that friendly poopless back yard to play in, but we'll get there, (the kids will get there I should say!) and Orso loves his big yard! He definitely does not nip like he use to or jump up, that's huge progress!! and we may need to find a friendly pet sitter when traveling some places over night, but Orso brings our family together and we all work at it with him every day. Orso has traveled and met so many new puppy friends his first year with us. We've had so many puppy lovers come to see him and he loves everyone back just as much! 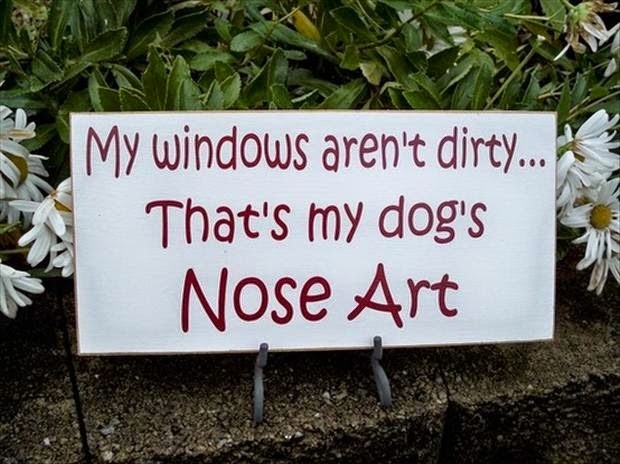 Thanks Julie for this one! Happy Birthday Sweet Orso!! Thank you to Kirsten, Christina and her "Operation Penny Crew" & Tiffany at Pawsitivly for teaching our family on how to work Paws-itively with our Orso! We've come such a long way learning from you about how to take care of our Orso!!! And to all the family friendly pet lovers out there that have met Orso already and hugged and loved him the minute you saw him, thank you.